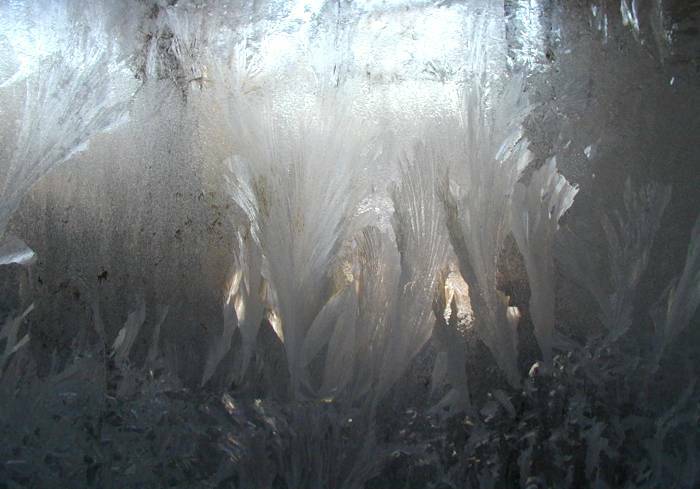 Frost on our storm door looked like large beautiful jungle plants lit by morning sunshine from a clearing in the woods. 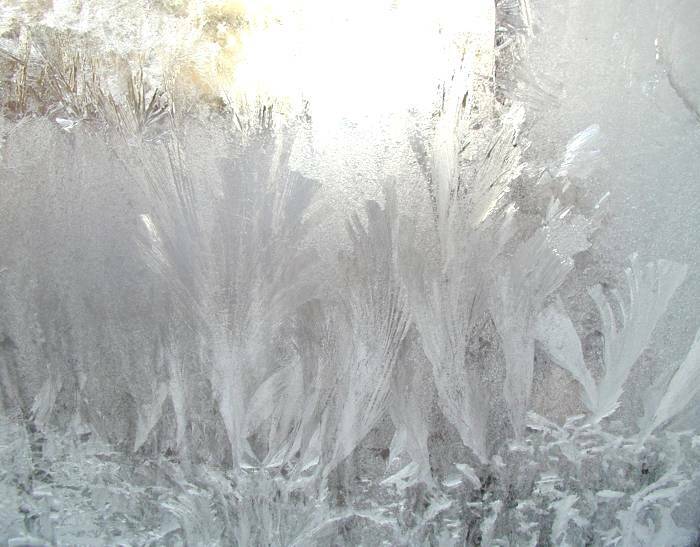 “Mom, do you think the frost on our door is so beautiful because I’m always so happy?” asked my son. He had previously looked at the awesome book, Hidden Messages in Water, where scientist Masaru Emoto showed how positive and negative words spoken at–or even just thought toward–containers of water had real effects on the pattern of crystals when the water was frozen. When looking at that book, my son remembered that a Ferengi in Star Trek The Next Generation had referred to humans as “ugly bags of mostly water.” And in fact, according to Dr. Jeffrey Utz (Neuroscience, pediatrics, Allegheny University, as cited by U.S. Geological Survey), humans are 55-65 percent water (except infants which are born at about 78 percent). Or humans are “about 70 percent water” according to NASA, which might be outdated truth since Dr. Utz goes on to say that basically the fatter a person is the lower their percentage of body water–and obviously the populace is getting fatter all the time, so we probably do average closer to 55 percent than 70 these days. But I digress. The point is that if we’re made up of a high percentage of water, and a thought or word can affect water, it can have a physical effect on our bodies! And on all sorts of other things around us. The idea that “words can’t hurt” has been outdated for decades, but while you can’t always control what words are spoken to you, you absolutely can learn to always control the ideas and emotions which you allow to linger inside your own head and which then resonate throughout not only your whole body, but also throughout everybody around you, manipulating energy and matter throughout your entire corner of the universe. If you want more evidence of the power of thought, read “Dying To Be Me: My Journey from Cancer, to Near Death, to True Healing” by Anita Moorjani. You carry an invisible tool that does not require the lifting of a finger to operate. You have the power to affect creation, your health, and everyone around you. Will you choose to wield it wisely, kindly and positively? Trying to be vigilant in controlling your thoughts and emotions is as tiring and impossible as pushing a train everywhere you want to go. However, if you get that train onto the right track, it will roll smoothly and take you where you want to go on very little fuel. As you learn to have the right outlook and manner of thinking, maintaining a positive outlook and joyful mood will become who you are automatically, rather than an act you have to maintain. Beauty and goodness is everywhere to be appreciated and enjoyed, to uplift and enrich— especially if you put it there! Think it. See it. Be it. 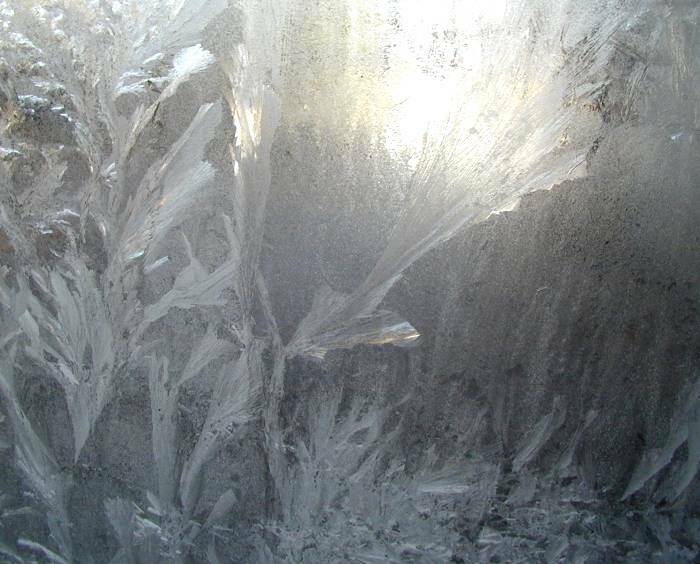 Bright and beautiful frost in the pattern of leaves, woodland plants, or seaweed. Our frosty storm door, with a different lighting angle and camera exposure, looked like a shady woodland scene opening into a sunny field.